Fortunately these days, Google is making it easier than ever to share your great reviews with the world, both online and offline thanks to the aptly titled Small Thanks with Google feature. 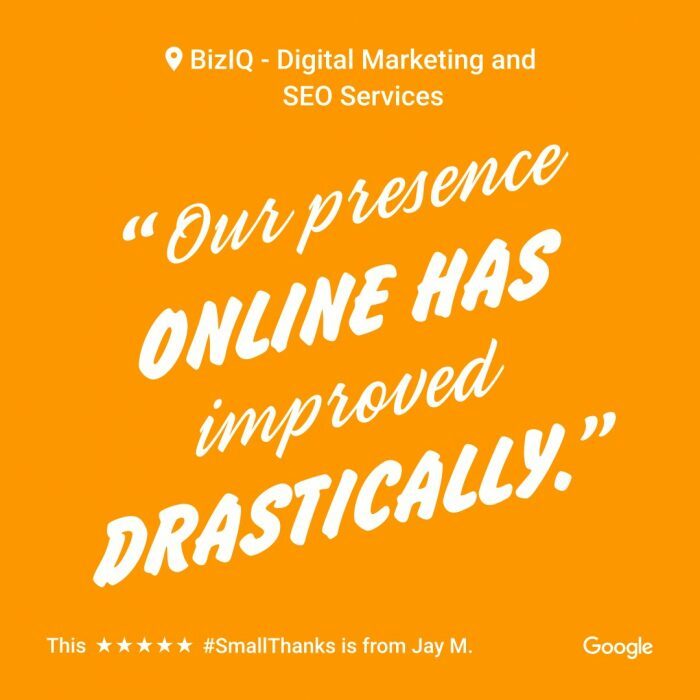 Released in 2017, Small Thanks makes it quick and easy for businesses to highlight their favorite Google reviews with ready-to-share social media images and printable posters to display in your shop. It’s easy, takes less than five minutes, and it’s free. Here’s how to use it. Navigate to the Small Thanks with Google official page. If you’re a BizIQ customer, you can access it right from your BizIQ Back Office under the Reputation Management tab. Next, type your business name in the search box and choose your listing. It may take a moment to process, but soon a customized toolkit of print and social media images will appear, based on what Google views as a strong review. If you’d like to make some changes to the review and layout Google automatically generated for you, simply click the “Personalize Your Toolkit” button below the download buttons. You can choose different layouts, select a different review, or choose a new color. If you’re satisfied with the suggestion and design, go ahead and download your toolkit. In some cases, you can even choose to have your toolkit mailed to you for free, complete with a poster, table tent, sticker, and window cling. Google reviews are more important than ever – so share away! Your online reviews play a major role in turning online visitors into real-life customers. With more internet users relying on Google’s gold star reviews to make purchase decisions than ever before, and Google review’s popularity overtaking review giants like Yelp and Yellow Pages, it’s a good thing sharing your great reviews with the world has never been easier. If you haven’t tried it yet, what are you waiting for?! Head on over to Small Thanks with Google and give it a shot. It’s quick, easy, and a great way to turn your customers into promoters of your small business.